It's cumbia time! Born in Colombia, this fusion of Afro-Caribbean and European musical styles is finally getting the attention it deserves. 'Arriba La Cumbia!' features cumbiaton anthems, housed-up bangers, gangsta-style ragga hits and several original stomping classics... all selected and blended by the 'Hackney Globetrotter' himself, Russ Jones. 'Arriba La Cumbia!' features contemporary tracks by Pernett & the Caribbean Ravers (from Colombia), veteran cumbia artist Aniceto Molina (originally from Colombia and now based in Texas), Fulanito (a group of US-born Dominicans), Mexico's Moonrra y su Batallón, as well as Puerto Rico's Tego Calderon and Calle 13. Vintage Colombian cumbia is represented by Alberto Pacheco, Los Guacharacos, Los Corraleros de Majagual, Lito Barrientos and Los Galleros. There are also remixes by top Mexican cumbia DJ Toy Selectah, and cumbia workouts by new European converts such as Up, Bustle & Out, Mo'Horizons and Basement Jaxx. Yes it's that time: the cumbia has arrived in full force. This much-maligned musical style from Colombia, often overshadowed by its latin siblings of salsa, mambo and merengue amongst others is finally spreading its wings and receiving the attention and praise it truly deserves. Conceived as a fusion of European and Afro-Cuban styles at the turn of the 20th century, Cumbia had its peak in the late sixties/early seventies and never really had the crossover appeal that the the sounds of Cuba and Puerto Rico enjoyed. But that is changing. The rhythm can now be heard all across Latin America in both the form of the vintage recordings from the last century, and now in new crossbreeds with hip hop, reggaeton, ragga, house and grunge coming out of Argentina, Colombia, Mexico, LA, Puerto Rico and beyond. One key cumbia evangelist is DJ Russ Jones (Future World Funk, "Gypsy Beats & Balkan Bangers"), who is renowned for his many compilations, remixes and club nights and is always searching for the latest global dance music phenomenon. The sound of cumbia is the next big thing for Russ - and Arriba La Cumbia! is the result. 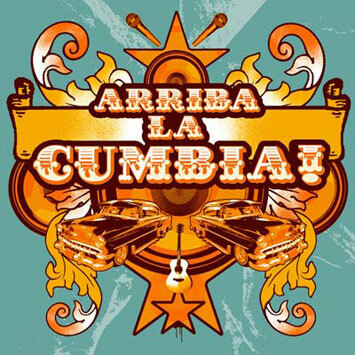 With tracks from various Latin American countries and further afield, covering the various styles from cumbiaton, housed-up bangers, gangsta-style ragga hits and several original stomping classics, Arriba La Cumbia is the wildly exotic, irresistible, sizzling hot sound of now. Feat. contemporary tracks by Pernett & the Caribbean Ravers (from Colombia), veteran cumbia artist Aniceto Molina (originally from Colombia and now based in Texas) and Fulanito (a group of US-born Dominicans), as well as Puerto Rico's Tego Calderon and Calle 13. Vintage Colombian cumbia is represented by Alberto Pacheco, Los Guacharacos, Los Corraleros De Majagual, Lito Barrientos and Los Galleros. There are also remixes by top Mexican cumbia DJ Toy Selectah, and cumbia workouts by new European converts such as Up, Bustle & Out, Mo'Horizons and Basement Jaxx (with an exclusive new track).